Winter Is Coming… Wait, Isn’t It Spring? It’s been well over a year (August 27, 2017, to be exact) since we were all in awe from the season seven finale of the popular HBO series Game of Thrones. The world has been waiting for the eighth and final season to come out, including a handful of players on the Seahawks roster. The wait is soon to be over for Thrones fans such as long snapper Tyler Ott, tight end Will Dissly, and offensive tackle Duane Brown. The premiere of season eight airs this Sunday, April 14, at 6 PM PT on HBO. Our players have been consistently expressing their excitement throughout the past few weeks as they await the ultimate fate of Jon Snow, Daenerys Targaryen, and the rest of the Westerosi. Many folks out there have been urged to hop onto the bandwagon and catch up with the series to get on pace with the soon-to-be-released season eight. There’s a stat out there in the world that it would take approximately two days, 15 hours, and 30 minutes to watch all seven seasons. That being said, if you want to get up to speed, you may have to start now. Like, right now (and potentially watch a few episodes on double-speed). The series has received 47 Primetime Emmy Awards, including Outstanding Drama Series in 2015, 2016, and 2018. There’s clearly a reason that the show has such a big following and why so many of our players follow it. If you’re a fan or you just want to have something to talk about if you ever run into some of our players, be sure to tune in on HBO. Today’s ‘Social Post of the Day’ comes from Seahawks defensive end Cassius Marsh, as he took to Twitter yesterday to celebrate National Pet Day. Seahawks.com’s John Boyle takes a position-by-position look at the current status of the Seahawks’ roster, focusing on the defensive line. Andy Benoit and Gary Gramling at SI.com share their opinions on what the Seahawks’ need from the 2019 NFL Draft. Gregg Bell at The Tacoma News Tribune elaborates on the Seahawks’ trading down in the 2019 NFL Draft. Re-live the Seahawks’ win over the Green Bay Packers in the 2014 NFC Championship game on the Seahawks channel using TuneIn. Every week throughout the offseason we will be streaming a throwback broadcast on the app. Next week’s show will be the Seahawks’ win over the Tampa Bay Buccaneers in 1976, marking our first win in franchise history. Download TuneIn here. 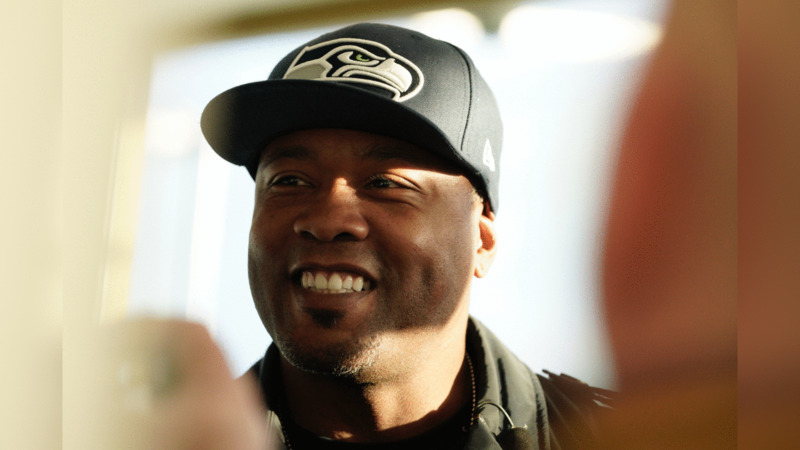 Seahawks Legend Lawyer Milloy raised the 12 Flag on top of the Space Needle on Friday as the Seattle Seahawks ready for their Wild Card playoff game agains the Dallas Cowboys on Saturday at AT&T Stadium. PHU NGUYEN/Monocle Phototography (C) All rights reserved.